> CC News > A Very Successful Gala! Saturday April 30th over 200 guests attended our 2016 Gala & Benefit Performance held at Grace Farms in New Canaan, CT. It was a beautiful evening and a very successful event! We were honored to have Mayor Rilling of Norwalk in attendance with his wife, Lucia. There were many highlights of the night, having 7th grader Cris Barreto (center) from the Roton Middle School in Norwalk speak was one of them. 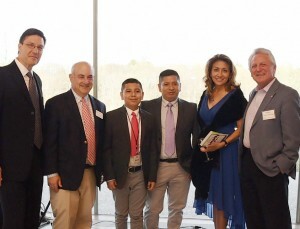 Cris is seen here with his Father, Oscar (center) and David Pritchard, Board Chair, Alan Steckler, Founder and President (left) along with Lucia Rilling and Mayor Rilling (right). The night honored Cherie Burton, long time friend of Creative Connections and former Board Chair. 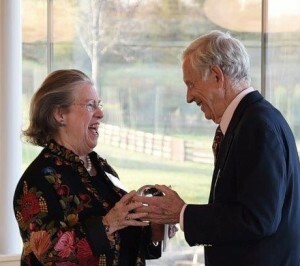 David Hurwitt presented Cherie with a beautiful glass globe engraved with “In Grateful Appreciation for your Outstanding Leadership and Dedication.” We wish to thank everyone who helped make this event such a great success! More photos coming soon!